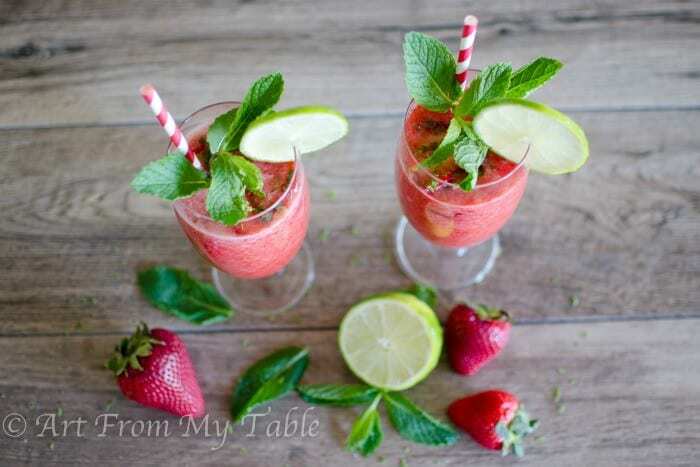 This Strawberry Mojito Mocktail is made with fresh strawberries, fresh squeezed lime, and fresh mint! 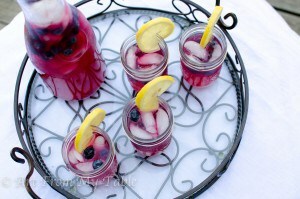 A perfectly refreshing summer mocktail that the whole family can enjoy! It’s actually good anytime of the year, but with strawberry season approaching, this will be especially delicious. Just another use for those fresh-picked strawberries. We don’t drink hardly any pop at our house. I’m just one of those type A mom’s that don’t think my kids should have pop until they’re like, 30. Okay, realistically, 12ish. Before you go thinking I’m the meanest mom ever, they have had pop before. I just don’t buy it. If they’re at an event or youth group or something, they’re allowed to have something clear without caffeine. More than that, if I have pop in the house, I’ll drink it. I love pop. Yes, pop, not soda, so you can see I’m from the mid-west. 🙂 Because of the whole pop thing, we need fun drinks sometimes. That’s why I love this strawberry mojito mocktail. All of my family can have it. It’s all natural and low on sugar. The inspiration for this recipe came from my friend Torie. I was at a party at her house and she was serving these. They were so delicious I wanted to have them again. So after asking her what was in it, I came up with my own version. Wow! Only 4 ingredients. Easy Peasy! First you’ll make a mint infused simple syrup (directions in the recipe card). This allows that mint flavor to really get through the whole thing. Then you mix all your ingredients together, and wah-lah! Or, Ta-da! 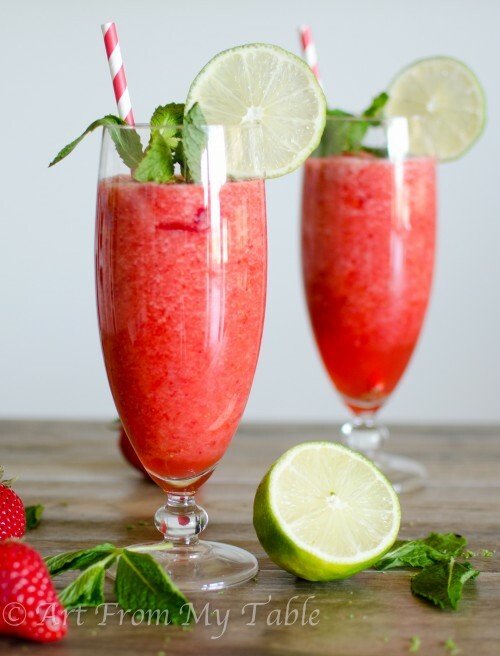 You’ve got yourself a wholesome tasty strawberry mojito mocktail! If you want an actual cocktail, add some rum. Simple, wholesome, all natural mocktail made with fresh strawberries, fresh mint and fresh limes. Make simple syrup by combining honey, water and mint leaves in a small saucepan over medium heat. Heat until honey and water are well combined, remove from heat and let stand for 30 minutes. Remove mint leaves and chill. 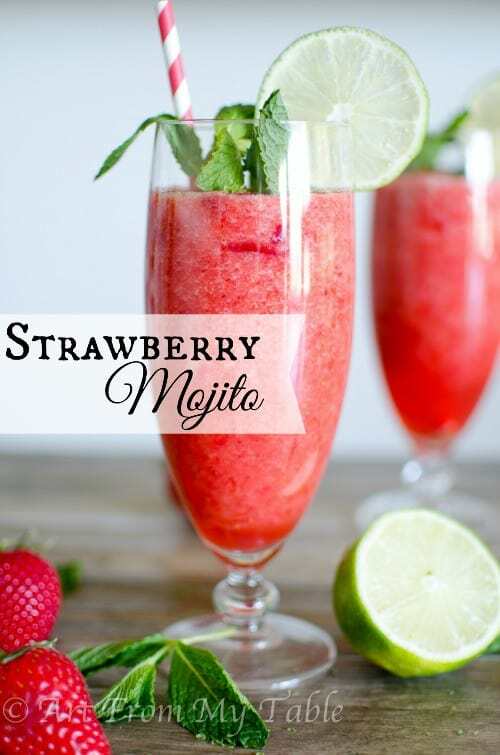 Place strawberries, simple syrup, lime zest and lime juice in a blender along with a few ice cubes. Blend until smooth, or desired consistency. Serve in glasses garnished with mint sprigs and slices of fresh lime. For an even lighter version of this, substitute the honey with a stevia based product. Just make sure you check a conversion chart, because they don't substitute equal parts. Looking for more family friendly beverages? Looks refreshingly good! I like that the recipe isn’t too sweet. 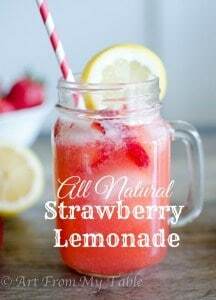 A great BBQ beverage! Yes! perfect for bbq’s! Or poolside. 😉 Thanks so much Erin! We don’t drink pop at our house either 🙂 I like this one for our summer BBQs! Yum! Oh how I long for summer Erin! You’re right, it’s perfect. I can just see myself pool side enjoying one of these! 🙂 Only wish you were closer so we could have one together. This is one of the prettiest drinks I have seen. This is going to be perfect for summer entertaining. Hope you can join me at Tuesday Treats blog hop? Thank you so much Claire! They’re perfect for summer! This looks unbelievable – mojitos are my favorite drink, and I love that I could share this one with my kiddos! Perfect for strawberry season! Definitely pinning to make for my hubby – he’ll love it! Awesome Raia! I’m thinking I’ll try a raspberry one soon too. This is perfect, the wife wanted something summery like a mojito while she is pregnant. I’ve not found the answer. Oh that’s awesome Michael! Blessings to you and yours! I love this recipe and really want to feature this in our website, GreenThickies. I will not post the actual recipe, but will only use one image from here and a small quote and link back to this page. Thank you!! They are always a hit at our house!